Soji Squares and Garlic Cream Prawns….. Success is not a destination…it is a journey. And I can truthfully say, that the road is not paved with success. There are gravel roads, highways and cobbled paths but there are more failures and disappointments than victories. I have never opted for the easier routes. It doesn’t sit comfortably but there are times that the road was clearly the wrong one. If we made all the right choices, we would definitely not work as hard. The lessons we learn often come from failure. There is so much we learn about our ‘inner circle’ only when we experience dismal failure…suddenly our good friends disappear and some of them stay close, encouraging and guiding us through the darkness. I am thankful for all the lessons…good, bad and ugly. Looking back over the past decade, I have been busting my chops…learning lessons on my journey and persevering through. I started out in the food world when I was 14 years old…buttering bread and rolling cutlery in paper serviettes. I started out by just lending a hand in the kitchen…running errands and always assisting the weakest link in the food chain. But as I climbed the ladder, every rung came with it’s own lessons and a better view too. I eventually opened a restaurant and that also came with it’s lessons. I loved food but hated the restaurant admin that kept me out of the kitchen. I paid my school fees and learnt very quickly that if I wanted to serve delicious food, I would have to work on the admin in the day and chef during the dinner service. Welcome to the life of a restaurateur…seven years of double shifts and three kids I wasn’t putting to bed later, I sold Salaam Bombay to concentrate on the career I have now. I started doing live cooking demos and became the brand ambassador to a large food corporate…I was still working double shifts but from home. I made samosas, thousands of them, for the Broadacres Superspar to fill up the financial gaps in my bank balance. The financial shortfalls was what led me to launch a range of spices called Curry Me Home at the same Spar. My first recipe book followed a few months later. Through this time, there was rejection, a few bad surprises and the road had been bumpy at the best of times. I have busted my chops since I was 14, and there are people out there that assume that a strategic marriage is behind my success. Frankly, my marriages have been the failure that has fueled much of my drive to succeed. I have experienced my fair share of divorce ugliness but will not be a casualty of the process or ugliness that comes with it. Marriage to a wealthy man can provide financial stability but it will not provide you with knowledge and wisdom to succeed as an independent woman. The men that claim that their wives had married for money lack good common sense. Imagine the foolishness of a man who does this, raising questions about his wisdom and intelligence. There have been a few murmurs going around and either way, whatever people believe, I am going to take it a a compliment…because I am that resilient, smart and business savvy to succeed. And if I ever decide to become that gold digger, I am sure that I will be successful at that too. As adults, we often speak of our sacrifices…quite recently and increasingly often, I watch my kids and think of how much they have sacrificed by not having me around as much as they would have liked. They complain sometimes but most often understand, accept and tolerate the workload that comes with the lifestyle we enjoy. But the lifestyle doesn’t come from what Indians refer to as ‘being a sponge’ or gold digger. If I opted in as a ‘sponge’, my kids would have had more time with me and definitely little respect! I have worked double triple time and still do, never turning down work and being an entrepreneur 24/7. I am a cook, teacher, author, TV presenter, PR lady and manufacturer! I have always known that no matter how hard you work, there are always ‘those people’ who just love busting your chops! The petty, mindless comments and stupidity of the gossip, leaves me asking questions about the lack of education and imbecility! When the fits of giggles subside, I recognize that lives can be that empty! All of this and I throw my hands in the air and declare, ‘To each chop, his own!’, I suppose! Which brings me back to the chops….here is my recipe for a golden oldie from Durban….Chop Chutney! 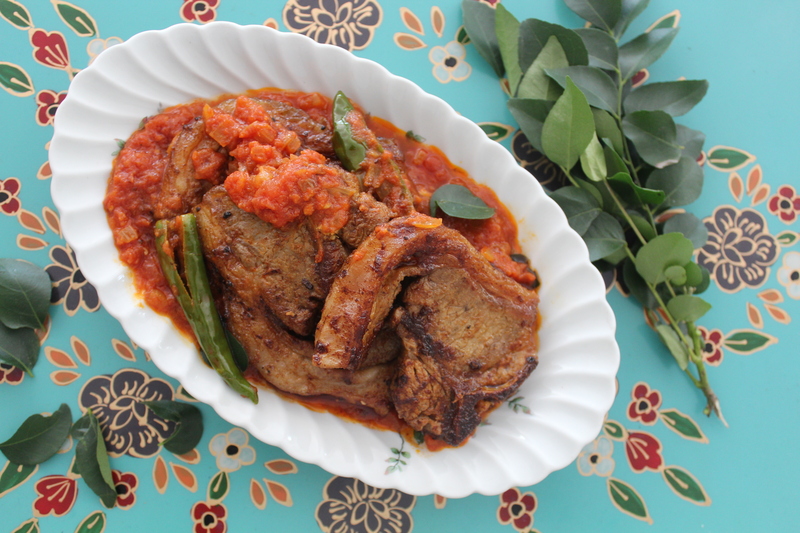 This is a Sunday favourite but also a great way to recycle lamb chops after a weekend braai. Pour the water into a 30cm AMC gourmet roaster, then add the ginger and garlic. Arrange the lamb chops in a single layer. Add a cinnamon stick and bay leaf. Simmer the chops until the water has evaporated and the meat is tender. The fat from the chops should be left in the pan. Fry the chops until golden brown and season with salt. Heat the sunflower oil in a 24cm AMC pot and fry the onions with salt until light golden brown. Add the curry leaves and chillies, saute for a few seconds. Stir the ginger and garlic into the pot and then add the red chilli powder. Add the tomatoes, then the remaining spices. Simmer until the sauce thickens and the tomatoes soften. Sprinkle in the sugar and pour the cooked tomatoes into the pot with the lamb chops. Toss the lamb chops in the tomato chutney to coat. Garnish with fresh coriander and serve. My first article for UN Empower Women….